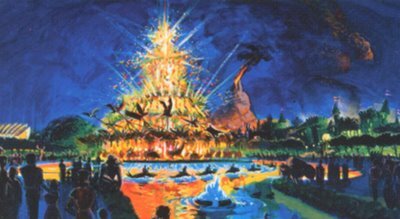 As the ideas that would become Disney's Animal Kingdom began to form, one of the most important choices imagineers would make would be that of the icon. Magic Kingdom and Disneyland have their castles, Epcot has the Spaceship Earth ball, and Disney MGM Studios had, well, either the Great Movie Ride or the Earfel Tower (and now a giant hat for pin station). So what would the newest park have? Many ideas were floated around and some we will cover over the course of time here. 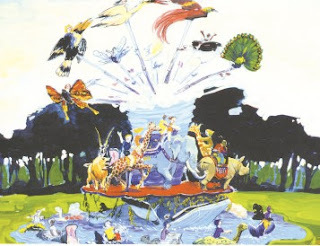 But one of the concepts that got the closest to being the winner was the carousel. And not just any carousel, but a three layered carousel. So what does that mean? Well, the idea behind the attraction would have been essentially, three different rides in one. At the top, there would have been a dumbo-style ride wherein guests would have flown on birds, butterflies, and bats. On that level, guests would be able to lift the vehicle up and down much like Alladin's Flying Carpets and Dumbo. The middle level would have allowed guests to ride land animals such as elephants, lions and zebra like on a typical carousel. Finally, the bottom level was a boat type spinner. At this level, guests would "board" dolphins, hippos and fish and circle around the other two portions of the attraction. The idea itself makes a lot of sense as a concept for the park. The Animal Kingdom is about animals and the natural world, so maybe the icon should show that. This choice, in that sense, is not far off from the icon we got. The Tree of Life's idea is to show all the animals linked in the natural world and this would have done just that, as well. To me, the Tree of Life is much more stunning but the ideas for the two are not far removed. But there were several issues with it. Most importantly, it just wouldn't have been all that big. Icons are supposed to be eye-catching, drawing you into the park. While certainly cute, and perhaps even impressive in a sense, this would not have had the stature of the Tree of Life with visibility throughout the park. Now, with Everest built, the Tree of Life holds its own in impressiveness, this carousel would be dwarfed by it. The carousel also would have required quite a bit of water in the center of the Discovery Island itself. At least one piece of concept art shows a fairly sizeable body of water. This would fundamentally have changed the layout of the central hub that is Discovery Island. 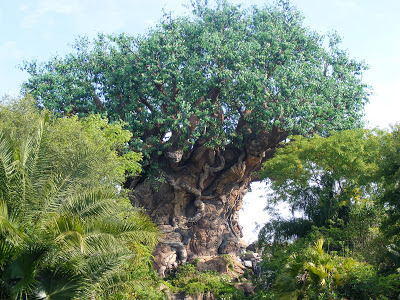 The Tree of Life just made more sense from a landscaping point of view. But I have to say, this does seem like a fun concept for the Animal Kingdom. And, like all good ideas, they never truly die at Disney Imagineering. A similar idea is found at Tokyo DisneySea in the two leveled Menagerie Carousel. But still, this concept would be a nice addition to the Animal Kingdom somewhere. It would be a fun addition to Camp Minnie Mickey if they decide to bail on Avatarland. Or perhaps, Chester and Hester could build a prehistoric version for their Dinoland. But I think the best place would be out in Rafiki's Planet Watch. It fits the theme of that are very well indeed, and would give the area a boost drawing people to the train station that leads you out to the Planet Watch. 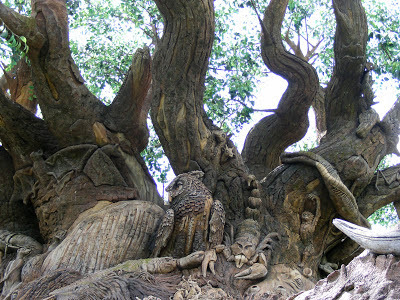 Another Hint of the New Disney's Animal Kingdom? Happy Valentine's Day Animal Kingdom Style! It Can Only Happen at THIS theme park!